I recently returned from another charter with our client, Legendary Rhythm and Blues Cruise. This is the world’s only fully chartered blues cruise that offers week long cruises and has been one of the longest running music theme charters in the industry. This marked our 20th charter with LRBC and we have primarily partnered with Holland America Line. After several years of offering East and West Coast cruises (from South Florida and California), LRBC ventured into new itinerary options for their October charters which included departures from San Juan and cruises to New Orleans departing from Fort Lauderdale in recent years. This past October, we returned to the Mexican Riviera from Los Angeles and a new cruise line partner in Norwegian Cruise Line. Norwegian Cruise Line “created” this 7 night itinerary for our client in the repositioning of the Norwegian Sun from Alaska back to Florida. The Norwegian Sun was the sister ship of the Norwegian Sky built in 2000 and marked the line’s second new build in 2 years at that time. The ship was built very much in the classic layout and offered our client a very large and open midship pool deck, ideal for production of music charters. The Sun also featured the lines “freestyle” concept with several alternative restaurants and dining at your leisure. For more information on the Legendary Rhythm and Blues Cruise, please visit www.bluescruise.com. When we started this process over a year ago, it was our challenge to find a ship that was in the right market for our idea. In the past 4 years, most of the cruise lines have vacated weekly departures from Southern California to the Mexican Riviera. While cruises are starting to home port everywhere from New Jersey to New Orleans, West Coast cites, except for the summer during Alaska, are starting to see their cruise terminals increasingly empty. Part of the problem with Mexican Riviera cruises has always been limited itinerary options. When a ship sails from Florida or other East Coast and Southern ports, there are a large number of Caribbean ports available for a seven-day cruise. From Los Angeles or San Diego the choices are, basically, Cabo San Lucas, Mazatlan and Puerto Vallarta – what I call “the Love Boat” itinerary. There are some other ports accessible in seven-days which are in the Sea of Cortez – namely Laz Paz and Loreto, however most cruise lines only offer these calls in conjunction with longer cruises as they are not well known to the average traveler. That said, in order to provide a viable solution, we needed to find a cruise line with the right size ship, at the right time of year, NEAR where we wanted to be. Our next step would be to approach them with our idea of “carving” out 7 days for the event. There were a few other factors we needed to line up and when we did, we approached Norwegian Cruise Line with our idea. The team at NCL was quick to advise they were interested and the negotiations ultimately delivered the Sun for the October 4, 2014 Los Angeles 7 night departure. We arrived at the Port of Los Angeles early the morning of October 4th to begin the load in for the charter. Because of the scale of this production, we had several prior phone calls to ensure we would have the right crane and enough labor to safely load-in as fast as possible for our scheduled departure time. We started off with some complications due to the fact that the ship had not yet been cleared of the luggage from the previous voyage and were set back hours from when we ideally wanted to start. Once we were able to start craning and loading we worked with the port agents, ship and dock labor to expedite this process. By the time the 10,000 pound stage was craned aboard and finally set, the pool was covered, and all of the sound and lighting had been moved to the appropriate stages, we were able to sail just one hour behind schedule. We met with the Captain during the set up and learned that we would be contending with some high seas and winds due to the Hurricane which was swirling around west of Cabo San Lucas but the good news was that we would be able to sail the charted course, without deviation or missing ports. NCL’s popular “Freestyle” cruising worked well for this charter as we didn’t have to shift around scheduled meal times other than extend the late night food offerings until 4 am. The NCL Sun has two main dining rooms and also features 6 specialty dining venues which have a surcharge from $15 to $30 per person. NCL offered their Ultimate Dining Package for $119 for the week which allowed unlimited visits to specialty dining restaurants for guests that purchased it. We enjoyed the sushi bar and Le Bistro the best but most venues were quite busy throughout. As mentioned before, we called on Cabo, Mazatlan, and Puerto Vallarta on this charter. I stayed on board in Cabo but did venture off in Mazatlan and Puerto Vallarta. I like this Mexico far more than the spring breaky Cancun, Cozumel, etc. that we normally get on East Coast cruises. The price is right too. Great food and drink were available in both ports for very reasonable pricing. In Mazatlan, a group of us headed over to Stone Island for a lazy day of beaching and 4 wheel ATVs. We stumbled onto a place that was barely open but did their best to make sure we had all the food and beverage we wanted. In Puerto Vallarta, we took a taxi to the Malecon and had a very nice day of it. Upon returning to the terminal, we stopped by the authentic Mexican boutique “Wal-Mart” which is located across from the ship. Hey, at least it wasn’t Diamonds International…. 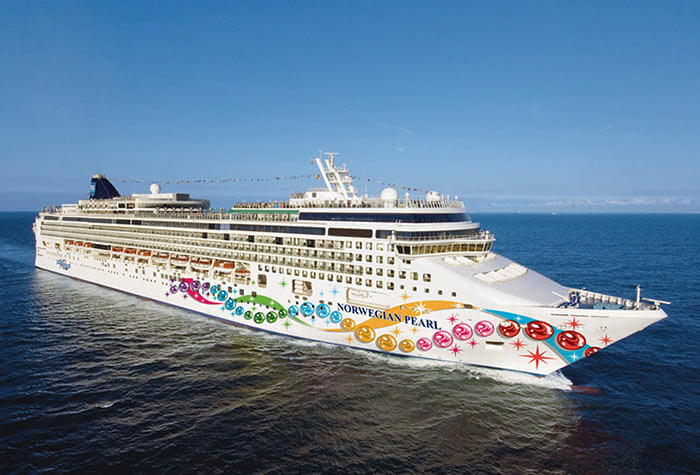 The NCL Sun is a serviceable vessel for a charter looking at 1900 guest capacity. There truly are very few options these days for ships under 2400 guests. Compared to the newer ships in the fleet, the NCL Sun is lacking many bells and whistles but the classic layout of the ship are a plus. These days so many new ships are so cut up with so many “extras” like pool deck cabanas, water parks and fountains, slides etc. These are all great amenities that I enjoy as much as the next guy but there is something to say about being able to get from forward to aft and knowing exactly where you are on the ship after just a few hours versus a week. The staff on the NCL Sun were outstanding to work with. We were very happy with the excellent Captain and Hotel Director that were very involved to ensure we had a great experience. We were also very happy to have Klaus Lugmaier, VP of Fleet Hotel Ops on board with us for a few days. I can truly say that we had one of the best support teams onboard the ship including our charter manager Brett from the office. The load in delays and overall dealings with the Port of Los Angeles (San Pedro) was a challenge. We have operated many charters from San Diego and being very honest, I prefer San Diego. From accessibility to labor teams and unions, Los Angeles was a mission. At the end of the day, we pulled it off but that’s what we do. Please feel to email me at leonb@www.cruiseco.com or call me at the office or on my cel should you want to discuss chartering a ship for your event or incentive. Even if there isn’t a ship doing what you’re thinking to do, we can seek out and look to accommodate your need at or under budget. This report was prepared by Steve Bloss (Breakaway) and Jim Castle (Getaway) on January 1, 2014. The views expressed as solely those of the author and not necessarily those of WWTCA.